UVACollab HelpUVACollab DocumentationFor Students Media GalleryHow do I upload an image or video to My Media from a phone or tablet? How do I upload an image or video to My Media from a phone or tablet? You can use your mobile device (phone or tablet) to capture and upload an image or video to My Media in your Home site. In your Home site, go to My Media. Go to your Home site. 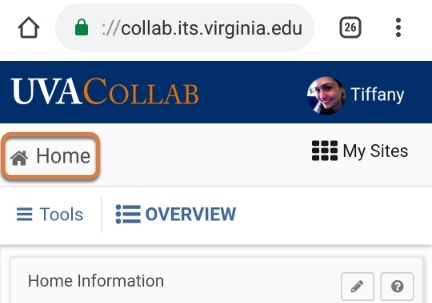 When you first log into UVACollab, you are placed in your Home site. 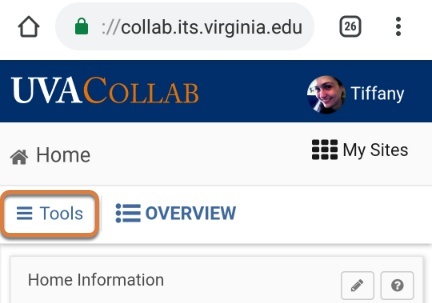 If you are viewing another UVACollab site, select My Sites, then Home to access it. 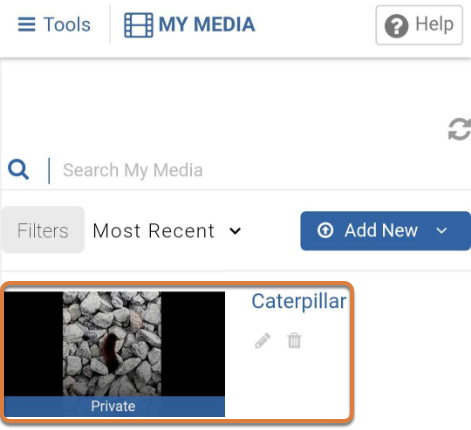 Scroll down on the Tools list to locate and select the My Media link. 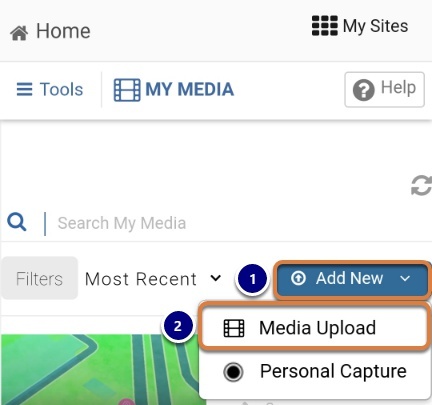 Select Add New, then Media Upload. Select the Add New menu. Select + Choose a file to upload. Select a source for the file. Select a source on an Android device. Capture Image - Take a photo with your camera. 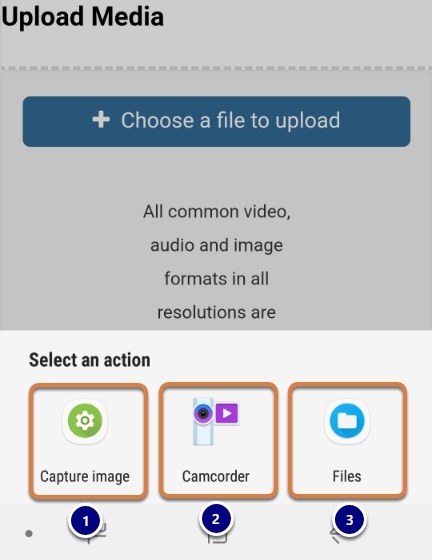 Camcorder - Record a new video file. Files - Select an existing file on your device. Select a source on iOS. Take Photo or Video - Take a photo or record a new video with the camera. Photo Library - Select an existing photo in your library. Browse - Select a file from another location on your device. 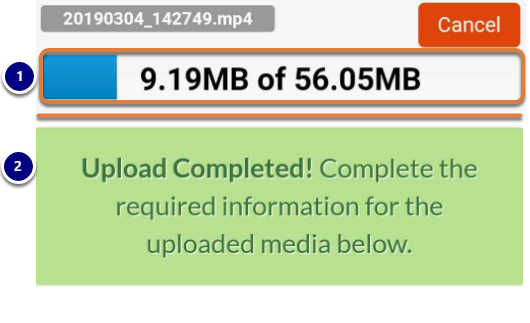 Depending on the size of your file, the upload may take some time to complete. During this time, the upload progress will display on the screen. When the file is successfully uploaded, an Upload Completed! message will replace the progress bar. Enter a name and optional details. By default, the Name will be the image's or video's original file name. It is recommended that you edit the Name to make your file easy to find. 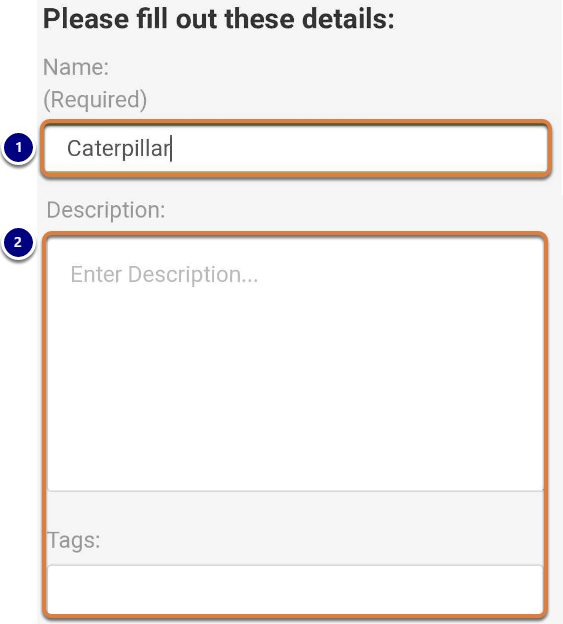 You can add an optional Description or Tags for searching. Save and access your media. Select the Go To Media link to go directly to the file you just uploaded, or select Go To My Media to go to the main page listing your media. Note: Media may require processing. Depending on the size of your file, some additional processing may be needed. 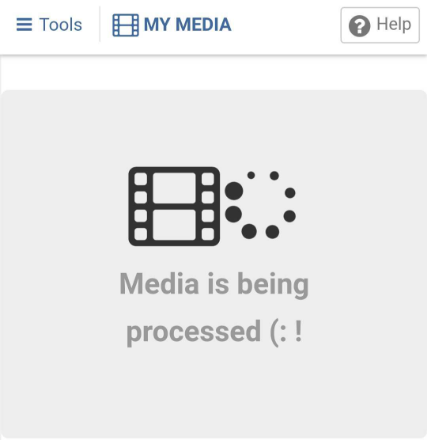 If this is the case, when you try to access the page of the newly uploaded file, a Media is being processed message will appear. When your video or image file has been fully processed, it will be available in My Media, and you can select it to view it. Prev: How do I submit a Personal Capture video or audio file to an assignment or assessment? 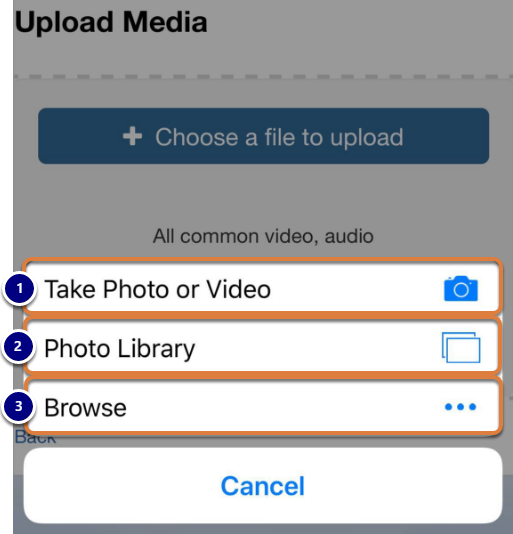 Next: How do I upload a video or audio file to Media Gallery? 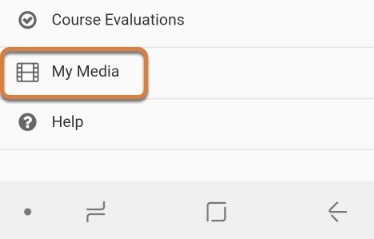 What is the My Courses tool? How do I see and access my sites? What is the Message of the Day? What are the Message Center Notifications? How do I set my preferences? What is My Resources in Home? What actions can I perform using the Rich-Text Editor icons? How do I create a link to a web site in the Rich-Text Editor? How do I create a link to a Resources item in the Rich-Text Editor? How do I create a link to an activity in the Rich-Text Editor? How do I embed an image in the Rich-Text Editor? How do I embed a linked web image in the Rich-Text Editor? How do I embed a YouTube video in the Rich-Text Editor? How do I add special characters in the Rich-Text Editor? How do I add/edit a table in the Rich-Text Editor? How do I add a Content Template in the Rich-Text Editor? How do I paste text from a Microsoft Word document in the Rich-Text Editor? How do I paste as plain text in the Rich-Text Editor? How do I embed a video or audio file from Resources in the Rich-Text Editor? How do I embed a Media Gallery file in the Rich-Text Editor? How do I record audio in the Rich-Text Editor, using the Record Audio Clip option? How do I add mathematical notation in the Rich-Text Editor? How can I make audio or video more accessible? How do I attach files from My Resources to submissions in my other sites? How do I complete a peer assessment assignment? How do students add and organize content on lesson pages? How do I submit a Personal Capture video or audio file to an assignment or assessment? Where should I submit work for courses in which I'm enrolled AND on a waitlist? How do I access my Course Evaluations? What are quotas and upload limits? How do I upload files to Resources or File Drop? How do I create folders in File Drop? How can students and site members add items to their File Drop folders? How do I upload or download files using WebDAV? Why aren't my folders or uploaded files working? How do I navigate forums and topics? How do I reply to a forum post (in a conversation)? How do I delete a forum post? What makes a forum post count as read? How do I access messages? How do I view my grades in the Gradebook? How do I view my grades in Gradebook Classic? How do I view Post'Em feedback? How do I view the results of a poll? How do I add and use pictures in my picture gallery? How do I modify my privacy settings? How do I modify my notification and other profile preferences? How do I customize my Calendar display in a site's Overview page? How do participants sign up for meetings? Why can't I receive emails from UVACollab sites? How do I view messages sent to Site Email? How do I submit an assessment (i.e. test or quiz)? What notifications can I get when I submit a test or quiz? How do I view the feedback on my assessment (i.e., test or quiz)? How do I create wiki pages? How do I add images or attachments to wiki pages? How do I watch wiki pages? How do I access the revision history of wiki pages? How do I view settings, preferences, and options for wiki pages? How do I submit anonymous feedback to my instructor? 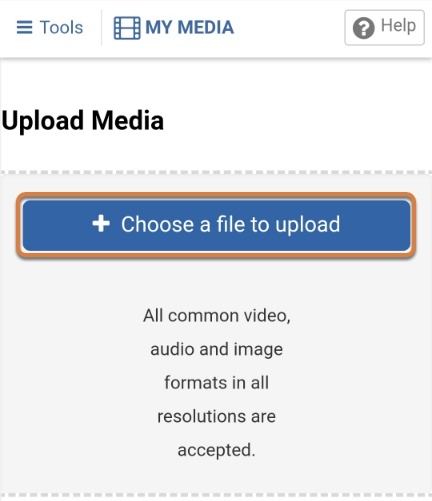 How do I upload a video or audio file to Media Gallery? How do I copy embed code for public display on the web? How do I unjoin a group? What is a joinable site? How do I join a site? How do I unjoin or remove myself from a site?